The North Sea is a sea that is part of the Atlantic Ocean in northern Europe. The North Sea is between Norway and Denmark in the east, Scotland and England in the west, Germany, the Netherlands, Belgium and France in the south. The Skagerrak connects the North Sea to the Baltic Sea. In the south, the North Sea becomes the English Channel, a sea between England and France. This is called the Dover Straits and is very busy with ships. The border between the North Sea and the Skagerrak is at an imagined line between Lindesnes in Norway, and Hanstholm in Denmark. In the North, the North sea is open towards the Atlantic. The border between the two is an imagined line from Northern Scotland, to the Shetlands, and then to Ålesund in Norway. According to the Oslo-Paris Treaty of 1962 it is a bit more to the west and the north though. The treaty puts it at 5° East longitude, and 62° North latitude. That is at the parallel of the Geirangerfjord in Norway. On average, the North Sea has a depth of only 94 meters. About 80 million people live near the North Sea, at most 150 km away from the coast. Together with the English Channel in the south, the southern North Sea is the busiest body of water in the world. Well-known rivers that drain into the North Sea include the Tay (at Dundee), the Forth (at Edinburgh), the Tyne (South Shields), the Wear (at Sunderland), the Tees (near Middlesbrough), the Elbe (at Cuxhaven), the Weser (at Bremerhaven), the Rhine and Meuse or Maas (at Rotterdam), the Scheldt (at Flushing or Vlissingen), the Thames, and the Humber (at Hull). The Kiel Canal, one of the world's busiest artificial waterways, connects the North Sea with the Baltic. Its name comes from its relationship to the land of the Frisians (see Frisia). They live directly to the south of the North Sea, and to the west of the East Sea (Oostzee, the Baltic Sea), the former South Sea (Zuiderzee, today's IJsselmeer) and the today reclaimed Middle Sea (Middelzee). But the spread of the name could also be from the view of the cities of the Hanseatic League. Some of its main cities, like Lübeck, Bremen or Hamburg had the same view. In classical times this body of water was also called the Oceanum Germanicum or Mare Germanicum, meaning German Ocean or Sea. This name was commonly used in English and other languages along with the name North Sea, until the early eighteenth century. By the late nineteenth century, German Sea was a rare, scholarly usage even in Germany. In Danish the North Sea is also named Vesterhavet (besides Nordsøen), meaning Western Ocean because it is west of Denmark. Satellite picture of the north sea. The area marked in red is the Doggerbank. Most of the North sea is on the European Continental shelf. On average, the depth is about 93 to 94 meters only. In the south it is very shallow, only 25 to 35 meters. In the north in the bathyal zone north of the Shetlands, this depth increases to between 100 and 200 metres. In the south, the depth is at most 50 metres. An exception to this is the Norwegian Trench. It is deepest there, with a depth of 725 metres. The most shallow part of it is a sand bank called Dogger Bank. In the southern part, there are many sand banks. the northern North Sea, with the Norwegian Trench, near the Skagerrak. The southern north sea is composed of the Southern Bight, before the coast of Belgium and the Netherlands and the German Bight before the coastline of Germany. The Dogger Bank is the limit between the southern and central parts. The Waddenzee runs all the way from Den Helder in the Netherlands to Esbjerg in Denmark. The Dogger Bank covers an area about half the size of the Netherlands. There, the North Sea has a depth of between 13 and 20 metres only. The area is very famous for fishing. With some storms there are even waves breaking there. The Norwegian Trench has an average depth of around 250 to 300 metres; at the entrance to the Skagerrak, the depth increases up to 725 meters. Along the trench is the Norwegian Current, which brings most of the waters of the North Sea into the Atlantic Ocean. Also, most of the waters of the Baltic Sea flow northwards here. About 200 km east of the Scottish city of Dundee there are more trenches, known collectively as the Devil's hole. Generally, the water is about 90 meters deep there. The trenches very often are only a few kilometers in length. In these trenches, the depth increases to up to 230 meters. In the Dover Strait the water is about 30 meters deep. At the end of the English Channel, this depth increases to about 100 meters. In the last ice age the North Sea was covered by large areas of ice called glaciers. 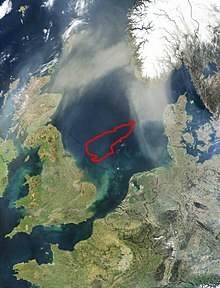 About 20,000 years ago the ice melted and the North Sea was formed (made). In the 1960s, geologists found large areas of oil and natural gas under the North Sea. Most of the oil fields are owned by the United Kingdom and Norway but some belong to Denmark, the Netherlands and Germany. Drilling began in the 1960s and led to a famous argument between England and Scotland about how the revenue (money) from the oil should be spent. People have been fishing in the North Sea for thousands of years. However, so many fish are now caught there that new ones may not be able to grow fast enough to keep the fishery going. Terns, Atlantic puffins, razorbills, kittiwakes and other seabirds live on the North Sea coast. Many coastal areas are protected nature reserves. This page was last changed on 26 December 2018, at 20:51.